This blog is designed to be a photo record of various trips to underground and ex-military locations I have been involved in. I hope you enjoy visiting the site as much as I have creating it, visiting the locations and meeting people with a similar interest. Some sites featured are on private land and were either visited on official trips with the underground and research societies I belong to, or permission was directly sought from the owners by myself. Other sites featured here are open to the public as tourist attractions or are on public land, but care should always be taken when visiting as there may be hidden dangers. These pictures have been taken over a number of years, so it is possible that ownership/access may have changed. See red italic writing on each site page for details of access. If you know of (or even own) an underground or defence site, which could be featured, please let me know! I am fully insured through the BCA for visiting underground sites. Many thanks to all those people who have taken the time to organise trips and to owners for allowing access. Thanks also, to the Palmerston Forts Society for permission to use some of their plans, other plans were drawn by myself, using Serif Drawplus x4. I welcome your comments, which you can leave at the bottom of each page. I will try to respond asap. I am particularly interested if you can add further information about the history of a site. I am keen to support the Western Heights Preservation Society, please take the opportunity to visit the Drop Redoubt & Grand Shaft on the next Open Weekend! 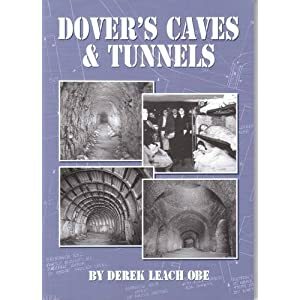 Please also click the link below to visit Amazon's page for 'Dover's Tunnels and Caves', by Derek Leach, which is an excellent book, and features some photos from this website. 2015 - After a break of 2 years, the site will now continue to be updated. 17th November - Mellieha Air Raid Shelters added, Fort Burgoyne & Fan Bay pages updated. heyy col could you put a link to my site on here please, ? and is it alright for me to put yours on mine too ? your website is fantastic. i live in Folkestone and never knew most of these places existed. love all the urbanesque concrete photos. Nice one. hi there loving the photo's of these places, do you think that there is any chance some could be investigated by a proffessional paranormal investigation team ? some places look very dangerous, but others look quite good to explore. www.soulsearchersuk.com is a good website to check out as we have been to drop redoupt at dover too. keep up the good work ! Hi Colin, How Impressive - Brilliant blog! i'm sending this to a friend of mine who will love it and bring back lots of memories. I have even been tunneling in my youth (st margarets and the borstal moats) great fun!! Hi, I had access to the Fairlight Bunker Yesterday and took a series of 6 pictures - As you do not have any on this site, Do you want copies of them. As a student of military history and a lover of fortifications, I would like to say I find this site a fantastic resource, it has given me access to sites I am unable to visit (I live in Lincoln, a place famous for it's lack of interesting fortifications). Keep up the good work.